OldManRider - Advice, stories, and interesting things for the older rider - passion for riding to better health. This year’s training season isn’t over yet – and maybe it’s just gotten a bit longer! Finishing up this year’s riding season with a bunch of meaningful photos. I hope you enjoy them. A Decathlon Sporting Goods Store has opened up here in Chiang Mai. There are a lot of very good things about Decathlon; great selection, great price, and a good quality spread. But, it’s means that our local bike shops now have competition and that is hurting their businesses. Kind of sad to see them go but we all have to adjust to the times. Author OldManRiderPosted on May 18, 2017 Tags bicycle, bike, Blog, Chiang Mai, Decathlon, Decathlon Stores, Decathlon-Sporting Goods Store, Local Bike Shop, road bike, Sporting Goods, Thailand, VlogLeave a comment on Where have all the local bike shops gone? Sometimes I just have to get out. It probably wasn’t the smartest thing because my voice totally went and I had a good sore throat for the next two days. But, I saw the elephants https://twitter.com/oldmanriderr/status/843294956487770113,climbed a mountain https://www.strava.com/activities/903482202, and feel better about everything today. Ride without Bike Shorts? Here’s why not. People, and a lot of YouTube videos, spend a lot of time comparing one brand of bike shorts with another. They compare a laundry list of features and decide what is best. But, no one seems to talk about what features are actually important to the rider. Anyone can read a product tag and parrot back marketing talk. This video looks at the four most talked about bike short features; cut, material, synthetic chamois, and leg grippers and decides that only three are important – because the fourth feature is common to all bike shorts. Author OldManRiderPosted on March 1, 2017 Tags bicycle, bike, Bike Shorts, Blog, Chamois, Cut, Cycling, Leg Grippers, Material, road bike, Seams, Shorts, Synthetic Chamois, Thailand, Tutorial, VlogLeave a comment on Ride without Bike Shorts? Here’s why not. I started hearing some chain noise and thought I needed to adjust my derailleurs. I knew my riding over the last several months has been focused on hills but I didn’t realize how fast that would wear the chain and cassette. I’ve been getting about the expected 2,000KM per chain and cassette but this time the amount of wear took me by surprise. I hadn’t even gotten to the mileage where I thought I should start checking for chain stretch. My good friend (and bike whisperer) Andrew looked at the bike for about 3 seconds from about 5 feet away and pointed out the problem – derailleurs look find but the chain was riding bad around the cassette in back. Hence the noise. The new chain and cassette make all the difference in the world. A technical side note is that the new cassette isn’t the same as what I had before (11/30). It’s a bit smaller (11/28). That’s going to make it a bit harder on the hills and I had a secret hope to either not change or go the other direction. Locations and links to photos of interesting places to ride around Chiang Mai, Thailand. 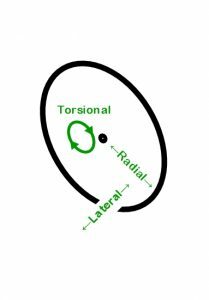 Torsional Stiffness: Am I Making This Up? When I crashed my bike, I ruined the front Shimano stock wheel and had to replace it with a new wheelset as you can’t just buy one wheel here in Thailand. The first wheelset I purchased was a Reynolds Stratus Elite set. Unfortunately, they were total junk and the freewheel failed within the first two weeks and after factory replacement the spokes pulled thru the hub. Not impressive. What intrigues me is the difference between the stiffness between the Shimano and DT Swiss wheelsets. There are three types of wheel stiffness; lateral stiffness (side-to-side) stiffness, radial stiffness (towards the hub), and torsional stiffness (twisting around the axis). I don’t think I can tell the difference between the wheelsets with respect to radial stiffness, the road vibrations feel the same. My riding style doesn’t push the limits of lateral stiffness so I haven’t experienced any difference there. Experts (see links below) write that there is very little, if any, measurable difference between the torsional stiffness of various wheels. However, I’m sure I feel a difference in how my peddling power is transferred from the crank to the wheel. The peddling impulse when riding the DT Swiss wheels feels sharper than the Shimanos. That’s a bit of a dilemma. I’m really convinced I feel something that is too subtle to measure. I think that means that what I’m feeling is not exactly what is being reported by the experts. I would really like to understand the subtleties. Author OldManRiderPosted on November 27, 2016 Tags bicycle, bike, Blog, Cycling, DT Swiss, DT Swiss R28 Spline, Lateral, Lateral Stiffness, Product Review, Radial, Radial Stiffness, Review, Reynolds, Reynolds Stratus Elite, road bike, Shimano, Spline, Stiffness, Stock Wheel, Thailand, Torsional, Torsional Stiffness, Tutorial, Vlog, WheelsetLeave a comment on Torsional Stiffness: Am I Making This Up?